For member access to the current issues published by Springer, go to the 'Member Access Page'. 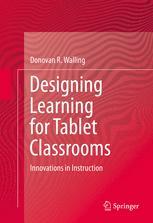 The focus of this book is instructional, or learning, design. It provides educators with theoretical and practical resources to capitalize on the strengths and versatility of tablet computers. It is a resource for non-techie readers written by a non-techie writer with extensive experience and expertise in innovative learning design and effective teaching. This book can also be read as an e-book, downloadable to a read-ing app on a tablet computer. Reading it as an e-book will provide for synchronous tablet learning. Readers can immediately apply or further investigate ideas from this book on a device already in their hands.